Germany's constitutional court rejects appeal of former SS guard Oskar Groening against his jail sentence. 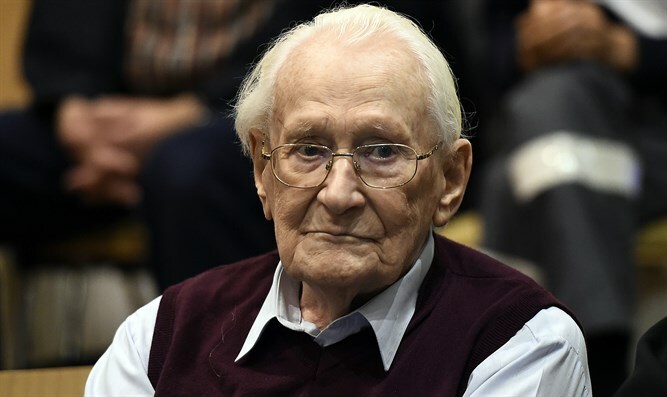 Germany's constitutional court ruled on Friday that 96-year-old Oskar Groening, the former Nazi SS guard known as the “Bookkeeper of Auschwitz”, must go to jail over his role in mass murders committed at Auschwitz during World War II, Reuters reported. Groening was found guilty in July 2015 of being an accessory to the murders of 300,000 Hungarian Jews at the death camp. He was sentenced to four years in prison at the time but has been living at home despite the conviction as he mounted an appeal against his imprisonment. Last month, a court ruled that he was fit to serve his four-year prison sentence. Several weeks ago, his defense team appealed to the constitutional court, claiming that jailing Groening at such an advanced age flouted his basic rights. The constitutional court rejected the argument by Groening's lawyers, adding that the gravity of his crimes meant there was a particular need for him to be seen to be punished. "The plaintiff has been found guilty of being accessory to murder in 300,000 related cases, meaning there is a particular importance to carrying out the sentence the state has demanded," the judges wrote, upholding the Celle regional court's ruling, according to Reuters. During his trial, Groening acknowledged "moral guilt" but said it was up to the court to rule on his legal culpability. He had previously been cleared by German authorities after lengthy criminal probes dating back to the 1970s. In recent years, Germany has begun a crackdown on Nazi war criminals. The crackdown began following the 2011 Munich trial of John Demjanjuk, a Nazi war criminal charged of assisting in the murder of 28,060 people at the Sobibor death camp and sentenced to five years. The former Nazi died in 2012. Among a handful of convictions in Germany since the Demjanjuk trial is that of Reinhold Hanning, found guilty of complicity in the mass murders at Auschwitz. Hanning died at the age of 95 this year, before he could serve his jail term.